My circle of friends and family doesn’t necessarily reflect the population as a whole, but ZOMG everyone’s having babies. I’ve got two new nephews, a new niece, and a host of friends who birthed tykes in the last year, and I’m way more familiar with kiddo shopping than my childless status would suggest. For toys, baby home goods, or clothes for future seasons, I hit up brick and mortar shops—or, occasionally, local e-commerce brands— to find gifts. Here, I've rounded up (and mapped!) 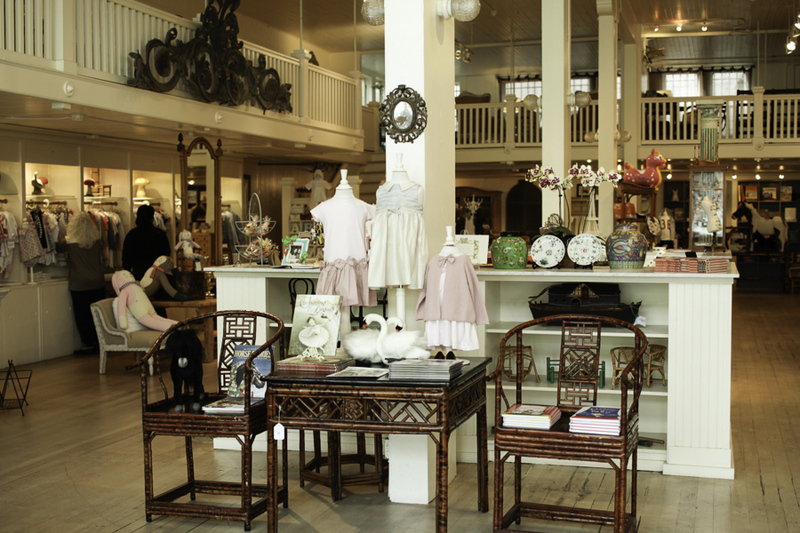 my go-to spots and sites to make your next shopping adventure for the little ones a breeze. If you don’t know what to give a kid, budget about 30 minutes just to play in Mapamundi. The small, well-organized spot in Noe Valley has lots of old-school toys that promote imaginative playtime, and the staff is super helpful in making gift recommendations. While I mainly shop here for the toys, they also have cute clothes and decor. Two locations—Inner Richmond and Cole Valley—filled with vintage-y kids toys, books, cards and knick knacks. If you’re shopping with kiddos in tow, Tantrum’s carnival-themed decor might distract your little ones from realizing that they’re actually shopping. Once a kid outgrows the desire to ingest small toy parts, I switch to educational toys and kits. Science experiments, math games, coding challenges, design sets, puppets—really anything that could potentially increase brain power or make a child more creative. Does that make me a Tiger Auntie? Probably. But I’ll be damned if the gifts I buy don’t get my friends’ kids into Ivy League schools. Paxton Gate has an outstanding selection of kits (and puppets) if you’re looking to project your goals onto the next generation. A photographer friend introduced me to Chloe Fleury’s paper animal heads, and now I desperately want an entire flock of the sold out flamingo heads for my apartment. Fleury, a San Francisco-based illustrator and stylist, puts a chic twist on the plush-mounted animal head trend by rendering her designs in paper. The heads come as flat-packed kits which you can fold and mount yourself. If a kid is going to toddle between the stately homes in Pac Heights, that kids needs an outfit that looks like it came from a Norman Rockwell painting or an American Girl doll. Enter, Mudpie. This Fillmore Street shop’s window is always filled with the most beautiful children’s clothes. If you’re shopping for someone locally, and you have the budget the blow, I highly recommend stopping by. They also carry darling plush animals, along with children’s toys and books, and furniture. Cats and babies both love cardboard boxes. Think of the number of times your kid (or your friend’s kid) has been more excited about giant Amazon box than the actual gift inside the box. Aldea Baby’s Calafant Castle is the perfect hybrid of a box and a toy because it’s a white cardboard castle that kids can color. Aldea also stocks classic wooden push cars and playsets, since San Francisco’s way more into wood toys than plastic these days. Oh, and if you’re looking for baby furniture, Aldea is a solid bet, as well. My all-time favorite baby gift is these Pendelton wool and leather baby moccasins from San Francisco’s Future Glory Company. Though the brand’s totes can be outfitted with an insert for use as a baby bag, this is the only straight-up baby product the company makes. At $65, they’re rather pricey for baby booties that a kid can only wear for 12 minutes, but they make an adorable showpiece on a nursery shelf when they no longer fit. No tyke shopping roundup would be complete without a trip to Fiddlesticks in Hayes Valley. The staff fills this gem of a toy-and-clothing shop with whimsy and fun, so give yourself time to take it all in. Looking for a cool maker-gift idea? Pick up one of their make-your-own root beer or bubble gum kits for less than $20. My understanding is that a first-born child can never be exposed to anything harmful, ever, while a third-born child can safely be left on train tracks to play with rabid wolves. Wherever a child falls in the birth order, parents love gifts from Sprout because the store’s wares are natural and organic— two words that can make any Californian swoon—and thoroughly safety-vetted. For newborns, I love their patterned cotton bodysuits. I learned about Giggle approximately 8 years ago when I needed a baby gift for a friend in NYC. I met a baby planner—yes, that’s an actual job, like Franck in Father of the Bride 2—at an alumni event, and he directed me to Giggle to pick up a Sophie Giraffe, which he described as “baby crack”. After I moved to SF, I switched to their Chestnut Street outpost for all my Sophie purchase needs. This is a full-service baby story, so if you’re shopping for baby furniture or strollers, enjoy their flat rate local delivery fees.